By all rights, Solo: A Star Wars Story should not have stood a chance. The second of Disney’s stand-alone “anthology” Star Wars films, Solo had a notoriously troubled production, the juicy details of which were splashed across Hollywood trade media. Original directing duo Phil Lord and Christopher Miller were fired from the project when their organized-anarchy comedic filmmaking methods turned off producers and execs and especially Lawrence Kasdan, writer of The Empire Strikes Back, co-scribe of the Solo screenplay (with his son Jonathan), and keeper of the flame of all things Starwarsian. Lord & Miller’s replacement was workmanlike Hollywood stalwart (and close friend of Star Wars creator George Lucas) Ron Howard, whose reliably pedestrian directorial style is quite nearly the polar opposite of their trademarked headlong, freewheeling, two-laughs-a-minute kinetic abandon. Additionally, lead actor Alden Ehrenreich, taking up the mantle of a younger version of the rogue-ish smuggler/space pilot with a heart of gold made legendary in the Original Trilogy and The Force Awakens by Harrison Ford, was said to have required an acting coach to figure out the role to the satisfaction of the higher-ups (the final result is a bit more than passable but generally too careful, which might have been predicted). One might as well add to all of this a certain sense of unrest and fatigue in the ever-fickle Star Wars fandom following the surprisingly divisive The Last Jedi, which came out only five months ago, and a sneaking sense in corners of the online fan community that Han Solo’s character arc was as complete as it needed to be and required no further filling in, in this film or any other. Given this leaden weight, it’s quite nearly a wonder that the the final form of Solo, with Howard holding sole directorial credit due to guild regulations, gets off the ground at all. But it does, you know. If it never reaches the galvanizing action heights and dramatic stakes of the last act of Rogue One (which was, again, largely overseen by a substitute director), let alone the raw emotional inculcation and thematic power of any of the main trilogy films, Solo is a perfectly serviceable genre-mashup potboiler, a space-western/heist flick without particular visual distinction that nonetheless constitutes, broadly speaking, a good time in the cinema. This is the sort of highly-qualified barely-praise that Ron Howard has built a long and surprisingly successful career garnering, and how he works diligently to garner it safely and effectively here. Some credit should be given to Opie for varying his style just enough to allow for some quick-cutting excitement (he did make the auto-racing movie Rush recently, so he must have learned something about the depiction of speed onscreen), but the comic timing is completely off the mark, with joke after joke falling badly flat. Despite a clutch of good elements, the knowledge that a Solo made by Lord & Miller – the Van Goghs of contemporary film comedy, lathering on gags and punchlines like thick globs of colour– would have been hilarious renders the Solo released with Ron Howard’s name on it an inescapable disappointment. Beyond these auteur-theory-centric textural complaints, Solo very much shares most of the common qualities – good and bad – of Disney-era Star Wars releases. Namely, a winking, self-aware willingness to prostrate itself before perceived fan expectations while slyly upending those expectations defines these proceedings, along with a persistent low-boil of progressive (indeed, bordering on openly socialist) politics. 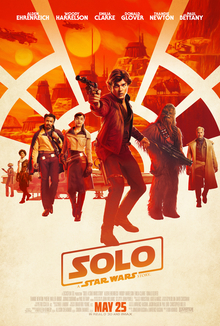 Certainly, Solo‘s convoluted story following young Han from the industrial canyons of his native Corellia through muddy Imperial battlefields and into an escalating series of heists featuring shady criminal syndicates and numerous switchbacks, double-crosses, and conflicting loyalties exists largely to exhaustively depict the incremental clustering of the various qualities, accessories, and associates that defined the galaxy’s favourite cynical badass rogue when he first appeared in the Mos Eisley cantina in an odd little space movie 40 years ago. His contentious, retroactively altered introductory shootout in A New Hope gets a final, definitive bookend at the conclusion of this narrative, and we are shown how Han Solo acquires his blaster, his iconic ship the Millennium Falcon, his Wookkie sidekick Chewbacca (Joonas Suotamo), his dandified high-stakes gambler acquaintance Lando Calrissian (Donald Glover), his signature boastful accomplishment (making the Kessel Run in less than twelve parsecs, some of the most famous nonsense technobabble in the movies), even his on-the-nose surname. While it’s busy ticking off these boxes, Solo complicates its anti-hero’s arc some as well. He’s given a first girlfriend, a Bonnie to his Clyde, Qi’ra (Emilia Clarke), a fellow survivor in a harsh environment who becomes inculcated in the criminal syndicate of interstellar gangster Dryden Vos (Paul Bettany). He’s given an underworld mentor, Tobias Beckett (Woody Harrelson), whose deep-crusted cynicism makes Han look like a rosy-cheeked optimist in comparison and who teaches him some valuable lessons in outlaw endurance. More than that, however, Han’s experiences in Solo seed the slumbering sense of justice that keeps bringing him back to the Rebel fold in the Original Trilogy despite his insistence on believing in nothing but his own wily instincts of self-preservation. His youthful subsistence on Corellia, a sort of decaying outer-space Rust Belt manufacturing centre where his proletarian father was laid off from building freighters, takes place among exploited refugees and endemic human trafficking. He insubordinately dismisses the pointless brutality of the Imperial war effort when serving in the Empire’s armed forces, pointing out to a superior officer that they, and not the fighters defending the planet the Imperial forces have invaded, are the “hostiles”. His allies later liberate a mining colony’s slave labour, droid and organic being alike, and his choice of sides in the final act conflict presages the Rebel Alliance and indeed gifts the resources to make its inception possible. These political themes are among Solo‘s better features. Others include Glover’s resplendent, cape-clad Lando (can the character support his own spinoff movie? Glover makes you wish fervently to find out), the ever-compelling Harrelson, and Jon Favreau and Phoebe Waller-Bridge in under-utilized CG-character roles. Thandie Newton is also sadly underserved as Beckett’s lover and heist-squad compatriot, although the spectacular sequence in which she figures, a theft from a train on a precipitous snowy-mountain track, is Solo‘s unquestionable highlight action setpiece. A scene like this, so centrally conceived and plotted out by and for visual effects experts, demonstrates how, in the case of Star Wars films just as most other CG-enabled Hollywood blockbusters, a certain inertia of technical accomplishment and imagination has a way of sweeping up movies and dragging them along for a ride, regardless of the artistic peculiarities of the form’s old-school creative centres such as screenwriters, directors, and actors. If the efforts of director Ron Howard are as competent but largely unremarkable as usual (considering the knockout work of the cinematographers of The Force Awakens, Rogue One, and The Last Jedi, there is little that is visually memorable from the very talented Bradford Young here), the screenwriting Kasdans do attempt to assert themselves, especially in the latter stages of Solo. One big particular late shock appearance of an iconic franchise villain (which is only a shock to those who aren’t familiar with the Clone Wars and Rebels cartoon shows, which admittedly is basically everyone) seems calculated to generate fan chatter and sequel buzz in the way that much more audacious twists provided by J.J. Abrams and Rian Johnson in the main trilogy installments did. The moment is far too much of an inside-baseball reference to carry much real impact, however, and fits in with the almost-oppressive sequel-teasing closing throes of Solo. Early reception of Solo, which is being greeted as a critical and commercial disappointment compared to the thunderous successes of the last three Disney Star Wars releases, is already being understood as prefiguring franchise fatigue on the part of a movie audience that has had to contend with an embarrassment of cinematic riches (four Star Wars films in three and a half years, more than half of them rather good) from a franchise previously known for its lenghty tantric absences from the marketplace. Solo is hardly an unmitigated failure and can be more than a bit fun when you give it a chance, but its general unremarkable (and occasionally even frustrating) quality is suggestive of corporate production imperatives and canonical gatekeepers that cannot get out of their own way and let a Star Wars movie simply take wing. Lord & Miller loyalist I certainly am, and maybe their approach and style wasn’t ever going to work for Star Wars. But the final product of Solo makes a compelling case that more should have been done at every level to make it work, because what we ended up with, while hardly a debacle, represents a definite missed opportunity for a franchise that, no matter its massive popularity, cannot afford many such misses.